You only have to ask a colleague about Blackboard to find that there is rarely a positive word to be said about this system. However if there is negative comment this is usually followed by tips to improve such a system; in fact everyone seems to know how to ‘fix’ Blackboard. Other staff are indifferent and so long as they can upload course materials then the ever present blackboard will be there to support students all year round. These content delivery systems do their job and of course there are many reasons why having materials available is good. However Blackboard and such systems often promise to enhance education and yet there is very little evidence that this is the case. Content delivery systems currently supplement teaching and can allow for additional tasks, lecture capture, wiki’s, blogs and other such tools. But it is worth noting that within Higher Education their introduction appears to have been driven from agendas that had little to do with enhancing education. Numerous JISC 1 reviews and reports (2002) indicate that systems have indeed been adopted and the install base have grown yet there is little in most reviews on the educational impact. While these points of view are both true my own focus is not on whether learning has occurred or whether a large install base is a positive thing, rather, I want to propose that there is a chance to reimagine the Learning Management System (LMS) from the ground up and to imagine it from a new perspective, namely a design perspective (specifically within the context of Art & Design Higher Education). For now let’s call it a design led learning system (DLS). I am not going to defend the need for a digital learning environment, but I agree that In education it is often taken for granted that technologies can ‘enhance learning’ (Kirkwood, Adrian and Price, Lind, a 2014). So this research and related outcomes will not take a technology focussed approach but a design led approach and one that uses the current conditions to suggest we stand at the cross roads were we have the technology (good network infrastructure), we have the features (the web), but we don’t yet have the right experience. Many may argue that the Personalised Learning Environment (PLE) will offer the answer. I think this will play a large role, however I still think (for now) there is a place for a Institutional Learning System (ILS), but one that fosters communities of practices and establishes new behaviours. I also argue that the MOOC (c or x) is not delivering this outside of an institute, although interesting I see this as another reinvention of the wheel with the suggestion that technology alone could disrupt specific location based learning within Education. Within the field of Art & Design education many argue for the studio culture (Murphy, 2012), with which I totally concur. Indeed the studio is where the best work is done and the chance to actually sit side by side with creative thinkers in creative surroundings and experiment is crucial. However I suggest there is a place for an ILS, perhaps it is just a repository of documents, a few blogs and lecture capture system. But I suggest we could try a brand new approach and, further, that stagnate systems such as Blackboard and the numerous re-inventions of Blackboard are in fact getting the starting point wrong. Many of these “new” Blackboards are being created from or with the “Silcon Valley” startup mentality; the Valley are all over Blackboard seeing it being ripe for disruption. These start-ups are the lean, mean and agile machines that can offer a pace of change that Universities supposedly can’t, yet much like Blackboard they have a technology or business focus point. We now see some VC companies such as Pathbrite appearing on the scene offering free online Portfolios to students, with the option for Universities to purchase the Pathbrite LMS as a grass roots attempt to disrupt Blackboard. (2014, educause.edu) Further, others are seeing the potential to mine data from these systems, using this data in all kinds of potentially invasive ways. Blackboard arrived (founded in 1997) in the middle of the dot com boom and bust, securing investment from AOL, Dell and Pearson and was profitable in the first year. Blackboard went public in 2004 and in 2006 was granted a patent for Internet-based education support system and methods. This was followed the same day by suing Desire2Learn (a blackboard competitor) for patent infringement which was only later settled in 2009 when the US patent office revoked the patent. This damaged Blackboards reputation and they soon reverted to a Private company. Another key factor to Blackboard dominance beyond early to market, was aggressive business tactics proposing that the system supported the administrative needs of institutes. (2014, Watters) Blackboard is very much a “business first” organisation that has now established itself in numerous institutes world wide. Blackboard costs can be huge for an institute: figures of $300,000 are not unusual. Another reason for VC interest indeed, and it can take even more years for Universities to consider changing and even more to actually change such a change is so costly that caution is a major factor. With the technology since 2001 really not changing much software providers attempts to out perform one another on features, or on sales tactics (Insidehighered, 2014). One huge road block, even after deciding one system supports the administrative and teaching functions within an institute better, can be that of staff re-training. So often it’s “better the devil you know” which brings these factors together and this make change increasingly hard. Innovation indeed seems to be stuck in the world of features (technology) and commercial interest. Change is hard, although there is recognition that there is a need to have something better. What we then often see attempts to combat the slow moving institutional change via a proliferation of systems across a University. Many would agree with Groom (YYYY) Blackboard is profiteering from the efforts of others However this proliferation of systems in turn adds to confusion. Staff may not even know there is a better option already installed and often these new systems are created within Computer Science Departments or tech savvy individuals who can connect open source projects together. These individuals within various faculties (Madsen-Brooks 2013) will doubtless use good knowledge of the administrative and learning needs of there students. But I argue again that these internal “startups” are often technology or administrative focussed or eventually left to languish on the shelf in the long run and that they are not daring or able to step far enough away from reinventing the wheel beyond the exception of perhaps installing a “cheaper”, more “customisable” and “open” system, such as Moodle 2. The tension between new tools and old practices should give you a hint. It’s simple to introduce iPads into the classroom, for example. It’s much more difficult to use them to do entirely new things, particularly things that run counter to how classrooms have operated in the past. We have too often seen this scenario play out with sectors slow to adopt a new practice whether that be the music industry and Napster or the publishing industry. The also stagnate digital publishing sector attempts to mirror current paradigms in a new space. Even the Apple WATCH is coming under fire and I think rightfully so for using the term WATCH, much like the term Blackboard, it hangs onto notions of previous practice. I shall attempt to see if a design led, Apple-inspired design authoritarian approach to the question of the LMS could offer up alternatives. I want to look at an LMS that hangs its decisions around user experience and user led design, which is not about making the interface bluer, prettier or bowing to feature pressure but takes its lead from a manifesto and at each step looks to delight3. In this post I have sought to set the scene. It is a call for commentary or additional resources that people feel I should look at. My next steps are to look at the role of the Design Manifesto and the visual representation of data (infographics). Reclaiming Innovation (n.d.) Reclaiming Innovation, educause.edu. Available at: https://www.educause.edu/visuals/shared/er/extras/2014/ReclaimingInnovation/default.html (Accessed: 27 November 2014). Madsen-Brooks, L. (2013) True innovation in Higher Ed will emerge from faculty-driven, open-source projects, not start-up commercialisation. Available at: http://blogs.lse.ac.uk/impactofsocialsciences/2013/05/15/beyond-disruption/ (Accessed: 27 November 2014). Northwestern and Washington State U., with similar needs, pick different learning management systems @insidehighered (n.d.) Northwestern and Washington State U., with similar needs, pick different learning management systems @insidehighered, insidehighered.com. Available at: https://www.insidehighered.com/news/2014/05/07/northwestern-and-washington-state-u-similar-needs-pick-different-learning-management (Accessed: 29 January 2015). , maban.co.uk. Available at: http://maban.co.uk/94/ (Accessed: 29 January 2015). Excerpt From: Audrey Watters. “The Monsters of Education Technology.” iBooks. Bainbridge, A., 2014. Digital technology, human world making and the avoidance of learning. Journal of Learning Development in Higher Education, pp.1–17. Kirkwood and Price (2014), in their review of technology-enhanced learning (TEL), note that the £12 million government allocation represents a significant investment in schools and universities. It is surprising that in a profession that can often be heard bemoaning the lack of fiscal support, that the £12 million has not had the impact it was expected. Significant voices in the world of TEL agree; Baume (2013), Beetham (2012), Hannon and Bretag (2010), and Holley et al. (2011) all raise concerns that the technology is taking over from pedagogy and crucially the practices of efficiency, surveillance and an apparent ‘opening up’ of HE, all detract from thinking about learning. Psychoanalysis teaches us that learning is a complex and difficult process, influenced by defence mechanisms that protect the individual from the anxiety inherent in confronting new knowledge. The use of technology in HE can therefore be located within a discourse of psychological defences, where the teacher and learner, influenced by an unconscious ‘passion for ignorance’ and simplistic split thinking, are seduced to avoid engaging with the difficulties and anxieties associated with learning. Instead, the seduction leads to fetish-like confused attempts to find satisfaction in learning mediated by digital technologies. Unfortunately, this technological product of human world making, with its own logic, ultimately confronts and maintains the damaging disruption of the dialogical holding environment relationship. Some reviews focus on assessing the uptake of technology in the higher education sector (e.g. Walker, et al. 2012). et al. 2010; Tamim et al. 2011). Many of the studies reviewed concentrated on the means: replicating and supplementing existing teaching. Fewer considered the second aim how. HE to help estalish social mobilty. 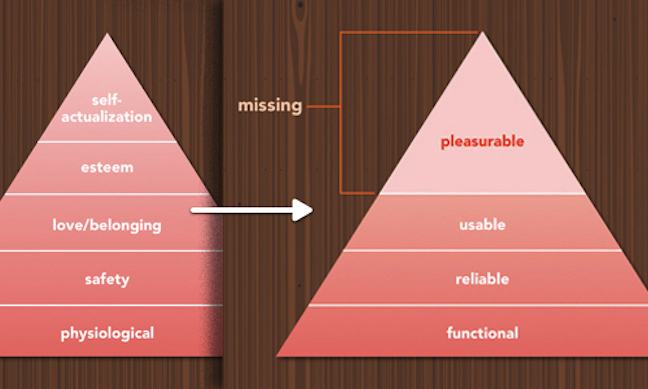 Walter, A. and Spool, J. M. (2011) Designing for Emotion. Murphy, C. (2012) ‘On Creative Spirit’, in The Smashing Book 4. Next PostNext A staff seminar about my PhD concept.